I just finished crocheting this Iris for my 97 year old mom. She saw it for the first time today, and was delighted. I have a couple more Iris’s to make, then I will complete the arrangement. I will drop in a photo when I’m finished. Just thought I would share my progress. The internet is a marvelous tool for discovering what people all around the world are doing, especially in the field of fiber arts. My great discovery has been in the field of crochet. I have crocheted off and on again in my life since I was taught at my grandmothers knee, but have never taken it to the level of some of the ladies in Italy and Russia. This is one field that you don’t need a translation for. In fact, I am sure that right now we could all get together in a room and share our expertise without sharing one word in our own language. All we need is the language of the needle or hook. If you haven’t explored this opportunity then please give it a try. Just type in your fiber art and explore some of the videos available, and don’t be afraid to try those from other countries- some actually have English translations. 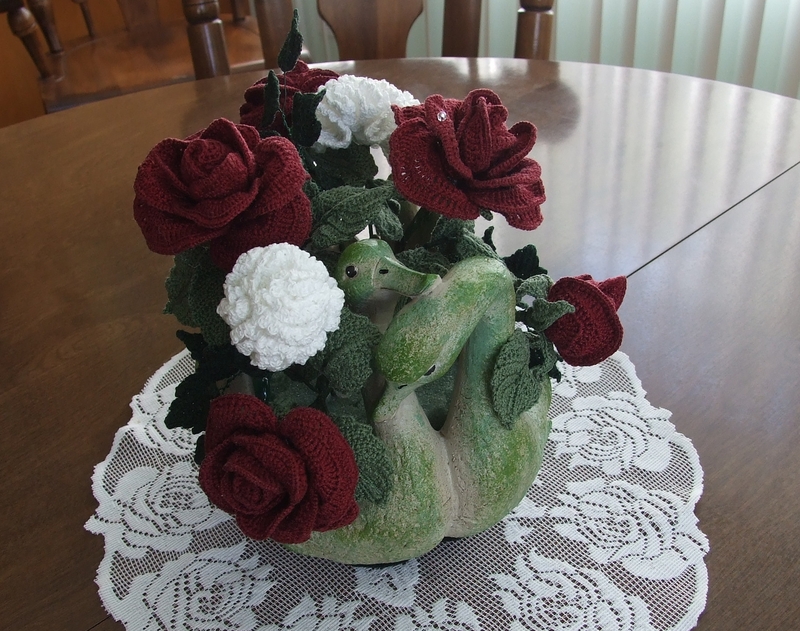 Below is my latest project-crocheted roses and carnations, as well as other flowers. I began by watching the video and them started tweaking the patterns and idea to suit myself. I developed a pattern for the leaves after seeing a photo on Pinterest. As always, I had to take it to the next level, and make it as realistic as possible. A lot of hours and samples went in to the results, but what fun I had. Roses and Carnations with a dark Ivy accent. To make the larger stem for the Iris, I used plastic tubing over the stem wire. 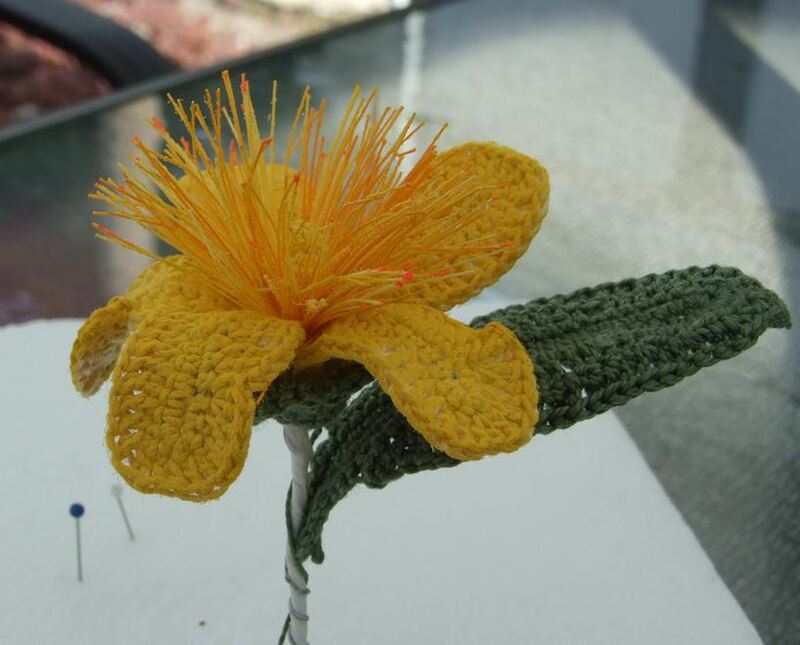 I crocheted the stem cover lengthwise to cover half the length of the entire stem, then designed the large leaf the encompass the remainder. The 9 petals of the Iris are made separately and wired to the main stem. 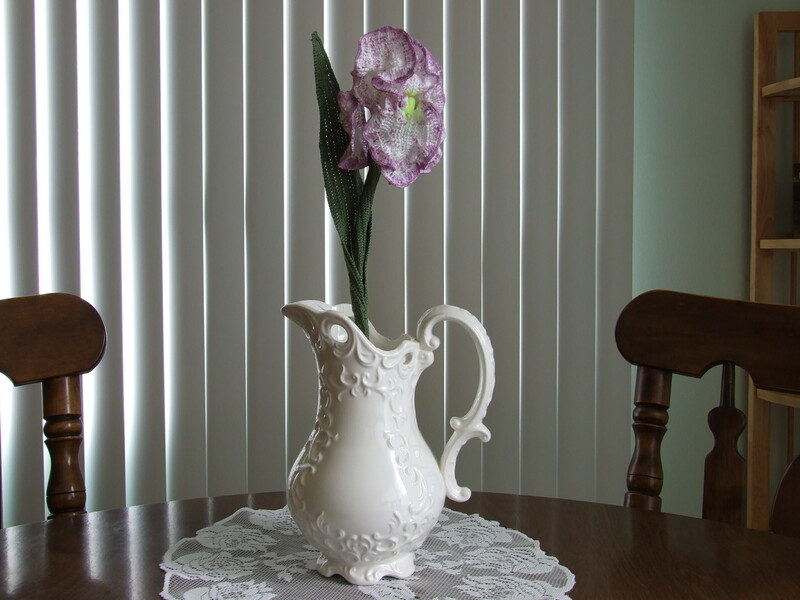 This project involved spraying size 80 thread with Laquer to make the stamen in the center. It was quite a chore but well worth it. 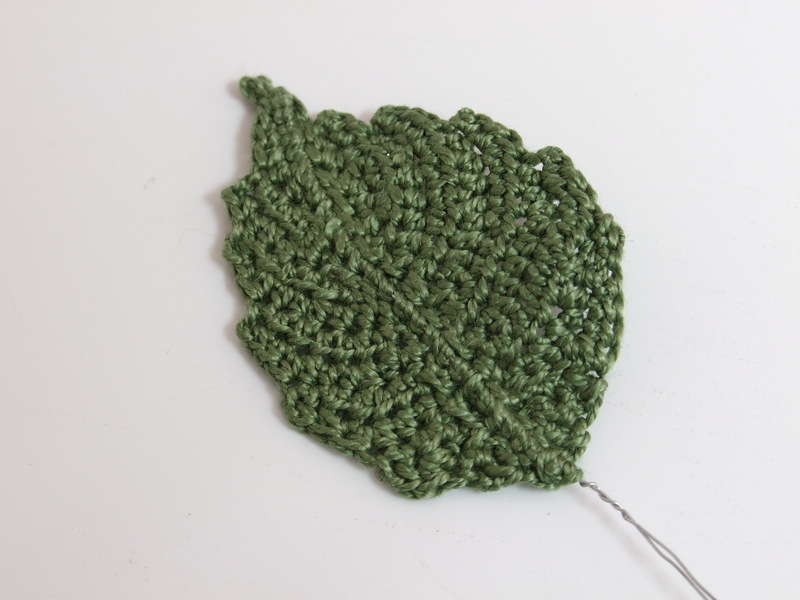 I am not quite finished with it, as the stem has many leaves. All my flowers are made using #32 or 26 wire. All my flowers start by taking apart the “real” thing. Each petal and element are made separate, then assembled. It has been a great adventure. I hope my photos will inspire you to do the same.